On reaching Delhi airport, meet our representative who’ll guide you to one of our listed hotels. Check-in at the hotel to relax in the cozy comfort of its room. Later in the day proceed to a city tour of Delhi. The major tourist attractions of Delhi include Red Fort, India Gate, Jama Masjid, Humanyun Tomb, Birla Mandir, Qutub Minar, Laxmi Narayan Temple and the President’s House. Stay the night at the hotel. Early in the morning, transfer to New Delhi railway station to board a train to Chandigarh. On reaching Chandigarh railway station, meet our representative who’ll guide you to the car that awaits you to transfer you to Manali. Sit back and enjoy the eight hours long drive to Manali. On reaching Manali, check-in at one of our listed hotels for dinner and overnight stay. In the morning after breakfast, embark on a sightseeing tour of Manali. The major tourist attractions of Manali include Hadimba temple, Gayatri temple, Bijli Mahadev temple and the Vashist Hot Water Springs. Later in the day visit Solang Valley which offers awesome scenery of snow clad mountains and glaciers. Solang valley is also well known for the adventure sports and you may try hands at Parachuting, skating, zorbing and paragliding. In the evening take a leisurely walk to explore Mall road to shop for shawls, kullu caps and many other woolen items. Stay the night at the hotel. Next day post breakfast, drive straight to Jispa. En-route visit Rohtang Pass and Keylong. On reaching Rohtang Pass, spend some time witnessing the panoramic beauty of Manali valley. After the visit continue drive to Lahaul valley to reach Keylong. Lhaula valley is quite rocky and barren. On reaching Keylong visit the Keylong bustling village to view the simple lifestyle of the villagers from close quarters and the Khardhug monastery. After the visit, resume your drive to Jispa, to spot amazing scenery and panoramic views of the lovely surroundings. On reaching Jipsa, check-in at one of our listed hotels. Enjoy overnight stay at the hotel. Next morning after breakfast leave for Sarchu. 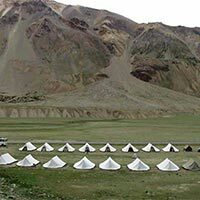 It is a major halt point that provides for tented accommodation on the Leh-Manali highway. Sarchu offers travelers with 15 Royal cottages and 24 Swiss Cottages for accommodation. 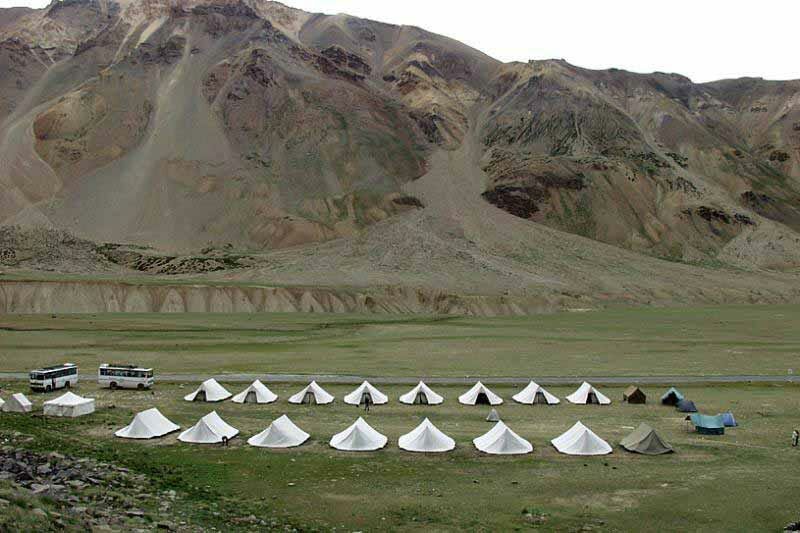 These camps are stitched out of canvas material which is prefect to save you from cold winds and are water proof. Enjoy an overnight stay at the camp. Early morning after the breakfast, leave to reach Leh. While driving to Leh, stop midway at Upshi to visit Hundur and Hemis monastery. Leh is located 222Kms away from Sarchu. As you reach Leh, check-in at one of the listed hotels. Spend the day while relaxing in your hotel room. In the evening take a leisurely walk to explore nearby Leh area. Return to the hotel for dinner and overnight stay. In the morning after breakfast move out to visit Thiksey Gompa, situated in the village of Ladakh. The monastery exhibits the gold-plated statue of Lord Buddha, called the Maitreya Buddha. Also visit the Indus Valley Monastery. The tour plan also includes a stopover at the Indus Valley monastery. Then return to the Leh city and after lunch visit the beautiful Stok Palace that lies on the bank opposite to Tsangspo River. Spend night at the hotel. Early in the morning leave hotel for an excursion to Stok village. Walk through the fields of barley to reach the village housing the Stok Palace and a private museum within the palace. The Stok museum showcases great collection world renowned Thankha paintings. Then pay a visit to the Stok Gompa, belonging to the yellow-hat sect of Buddhism. In the afternoon visit the magnificent Leh Palace. Also visit the Sankar Gompa, situated 2 Kms away from the market. Evening is reserved to visit the Tibetan Refugee camp, an important center of study of Tibetan literature, history and Buddhist philosophy. Retire for the night at the hotel. In the morning start your drive to Uley Topko. En-route, visit the Phyang and Likir monastery. 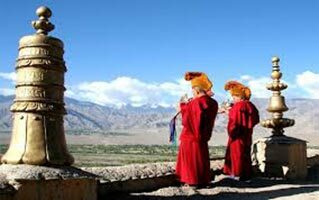 The Phyang monastery is a traditional monastery of Ladakh and is famous for its spectacular religious festival with masked dances. After visiting Phyang monastery continue your drive to Likir gompa which belongs to the Gelugpa Sect and features a 9m height statue of Lord Buddha. After the visit, move towards today’s final destination Uley Topko. On reaching Uley Topko, get accommodated at one of our listed tented accommodations. Stay the night in the tents. In the morning after breakfast, drive to Rizong and Lamayuru. On reaching Rizong, pay a visit to Rizong gompa. After visiting the Rizong gompa, continue drive to Lamayuru. The Lamayur Gompa is situated in Lamayuru village and is visited by a large number of tourists for its lunar landscape. Later in the evening drive back to Uley Topko for an overnight stay. Next morning after breakfast, drive to Basgo. Stop mid way to visit Alchi. 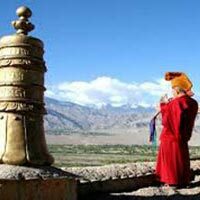 On reaching Alchi, visit Alchi monastery the most loved monastery of Ladakh. It is the only monastery built on the flat ground in Ladakh. After the visit continue drive to Basgo. On reaching Basgo, check-in at one of our listed hotels. Later in the day, visit the Basgo Castle, situated on the hill of clay. Rest and relax for night in the hotel. In the morning after breakfast, enjoy a full day excursion to Pangong Lake. The Pangong Lake is one of the most amazing lakes in the entire Himalayan region. The lake is set to change color 3 to 4 times a day. Return back to the hotel in the evening. Rejoice overnight stay at the hotel. Post breakfast, leave for Khardungla top. While going to Khardungla top you would be driving on the highest motor drive road in the world with a height of 18,390 feet. In the later part of the day enjoy shopping extravaganza. Enjoy overnight at hotel. In the morning after breakfast, transfer to Leh airport in time to board a flight to Delhi. As you reach Delhi, check-in at one of our listed hotels. Spend the day at leisure. Enjoy a sumptuous dinner and a comfortable overnight stay at the hotel. Next morning after breakfast, transfer to the Delhi airport in time to board a flight for onward journey. All Rights Reserved. Heavens Group.